Herbal Stress Relief uses plants to restore calm and strengthen the body, enabling it to recover more easily. All about herbal tea, growing herbs, drying herbs and other uses for you. The physical healing properties of herbs are well known and herbs are an important part of the healing tradition. Despite the move in recent times in the West to the use of sophisticated drugs to cure disease and treat ailments, many people still make use of traditional plant remedies. They are especially important nowadays as we seek for more holistic gentle ways to deal with stress and healing. Herbal stress relief works on many levels! As we look to healing our stress with herbs, we should cultivate a mindfulness of the connection between ourselves and our planet and renew an appreciation for the simple remedies that it offers for the stress-filled life that has become our lot. How do herbal remedies work? Plants take up substances from the earth and convert them into vitamins, minerals and carbohydrates, proteins and fats that can be used in our bodies for healing and nourishment. Most herbs have several healing aspects but one in particular will dominate. 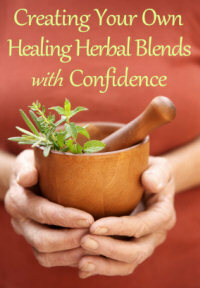 So, be creative and make your own blends based on what you need the herbs to do for you! For example, a mixture of valerian, passion flower and hops can be taken for sleeping difficulties...valerian is a muscle relaxant, passion flower aids with sleep and hops has a sedating effect on the nervous system...a great herbal stress relief blend! Herbs are natural stress relievers with little or no side effects and are a popular option to synthetic medications. Valerian is said to be the oldest stress relieving herb and Kava Kava the newest addition to the list...Click here to see my list of favourite stress relieving herbs. Have a look at more of my favourite herbs for more about which herbs can be used for everyday natural health. They can also be made into ointments, massage oils and creams to rub into the skin, and added to hot or cold compresses. A fun part of the stress relief "exercise" to grow and pick your own herbs, but herbal preparations can be bought. Be careful to buy from a reputable supplier. There are many excellent websites that sell herbal supplements. And makes your everyday living better!